Thank you for a great 2018 Boat Show! Mark August 11, 2018 in your calendar as the date of the MLA bi-annual Antique Boat Show in Port Carling. This year’s theme will be “Celebrating 125 years” featuring many of Muskoka’s oldest surviving boats, many more than 100 years old. Muskoka’s antique and classic boats are a unique treasure in the world and draw the attention of the most informed collectors. This summer we will celebrate the stories of some of these remarkable boats. We expect more than 70 boats to be on display and their proud custodian’s to be available to answer your questions about their history in Muskoka. The first boats in Muskoka were rowing skiffs, sail boats and steam powered boats beginning in the 1860’s. Canoes, rowboats and sail boats were built in Muskoka but the most of the steam powered boats came from southern Ontario and New York State. Larger Muskoka built boats burst on the scene in the early nineteen hundreds with the advent of gasoline engines. This year’s poster boat is from the in between years. The Heather Belle was built in 1902 by the Marine Engine and Machine Co of Harrison New Jersey. It was powered by a naphtha engine which was designed much like a steam engine but instead of boiling water it operated by boiling naphtha. As frightening as this sounds it operated at lower temperatures and pressures than steam and did not require a licensed steam engineer to operate it. The Naphtha also acted as a lubricant so required less attention while under way. 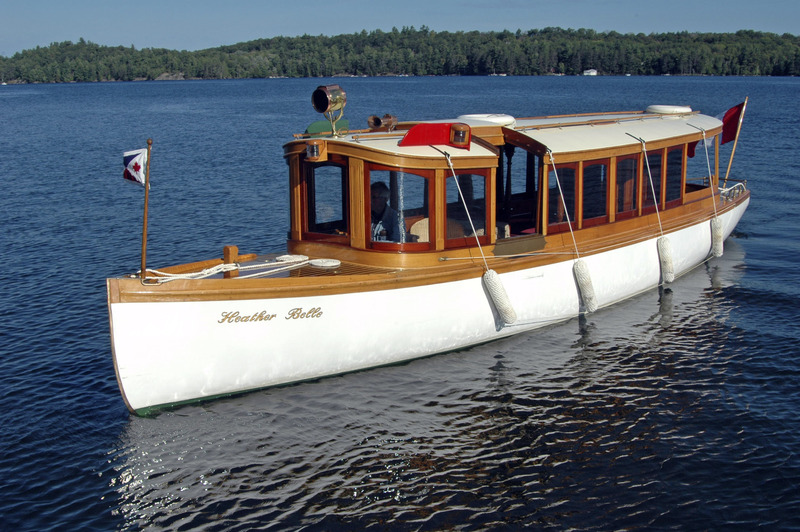 The Heather Belle was repowered with a gasoline engine and was operated for many years by George Thorel of Thorel House near Morinus on Lake Rosseau. Graeme Ferguson had the 36’ Heather Belle restored and repowered with an electric motor. He uses the boat regularly on the Lake of Bays and has kindly agreed to bring it to the MLA Antique Boat Show for your viewing pleasure. Come to the show to see this stunning historical artifact. The MLA Boat Show brings together fine surviving examples of the wooden boats built and used in Muskoka by those who went before us. These wooden boats are maintained and cared for as never before. The current custodians of these unique craft will be at the show and they love to tell the history and stories of their boats. With luck and love, these boats live on to tell their stories for many generations. This year also features demonstrations of Sea Fleas to stir youthful imaginations and a display of vintage outboard motors provided by the Maple Leaf Outboard Club. Rember Saturday, August 11 and come, and enjoy a day with these fine craft and their owners. The show runs from 10AM to 4 PM and admission is free.